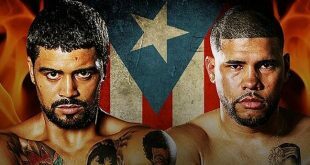 Ahead of their hotly anticipated clash tonight at Coliseo Roberto Clemente in San Juan, Puerto Rico, super featherweights Juan Manuel Lopez and Wilfredo Vasquez Jr both came in under the catchweight of 129 pounds yesterday. 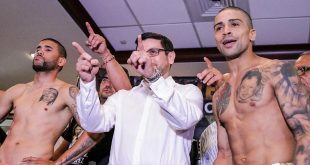 © Tom Casino / Showtime Boxing WBO featherweight champion Juan Manuel “Juanma” Lopez (28-0, 25 KO’s) weighed in at 125.3 pounds and Filipino challenger Bernabe Concepcion (30-2-1, 17 KOs) measured 125 pounds during Friday’s weigh in at Coliseo de Puerto Rico, in Hato Rey, just outside San Juan, Puerto Rico. 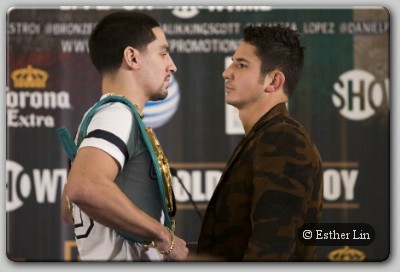 © Showtime Boxing Showtime is heading to the Caribbean for a world championship doubleheader this Saturday, live at 9 p.m. ET/PT, delayed on the west coast, from Hato Rey, just outside San Juan, Puerto Rico.